Made for year round use, the fabric is not too heavy for summer and not too thin for winter. The BayB Brand Car Seat Canopy fits all makes and models of infant car seats. Adjustable attachment straps allow for a custom fit. Machine washable, hang dry. Each one of our canopies has bold, fresh, cutting edge prints on 100% cotton outers with soft, snugly, lovable 100% polyester minky interiors. 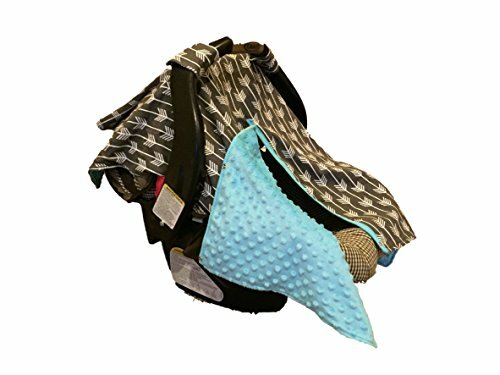 Don't go anywhere without one of these to give your baby the dark, snugly place they deserve while they are in their car seat. Stylish, car seat canopy to keep your babywarm in the winter and cool in the summer. Machine washable, hang to dry. 100% cotton exterior, 100 % polyester minky interior. Adjustable straps that will fit any car seat make and model. If you have any questions about this product by BayB Brand, contact us by completing and submitting the form below. If you are looking for a specif part number, please include it with your message.